It’s always amazing to drive through Yellowstone National Park and view the variety of wildlife. Bob Landis has made a career out of filming in the park, images that have been used in a number of wildlife films for big names like Nature and National Geographic. 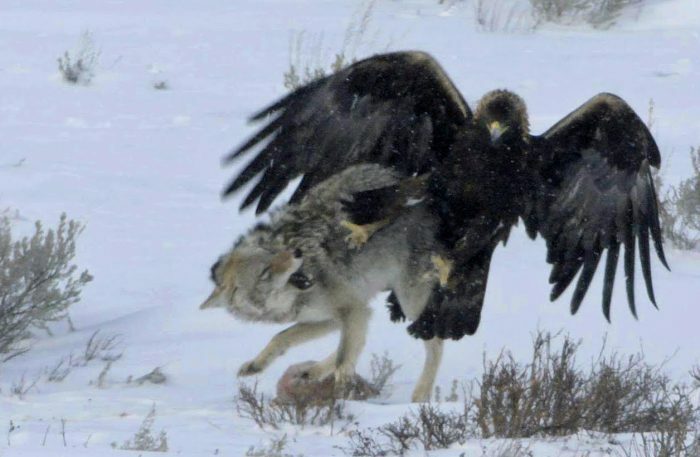 This past summer his most unusual encounter involved a coyote and a golden eagle. A coyote had made off with part of a bison carcass. Seeing an easy meal a golden eagle began dive-bombing the coyote to scare it away from the morsel. Instead, the coyote tried to grab the eagle the next time it swooped down. Landis was able to capture the encounter on film in slow motion. To hear about some of the other unusual shots he captured this summer, check out my story and his images in the Billings Gazette at http://bgz.tt/9acfo.